Russia's central bank jacked up interest rates for the third time since March. Russia is paying an ever higher price for its growing isolation over the crisis in Ukraine. The country's central bank jacked up interest rates Friday for the third time since March, taking them up to 8%. With inflation running at 7.5%, it had little choice. The crisis has led investors and companies to yank money out of Russia. This has crushed the ruble and raised the cost of imports -- helping to drive prices higher. The government hopes that higher rates will make it more attractive for businesses to keep money in Russia. However, it also means that both consumers and companies will have to pay more to borrow money. It raises the risk that the economy will sink further into recession. 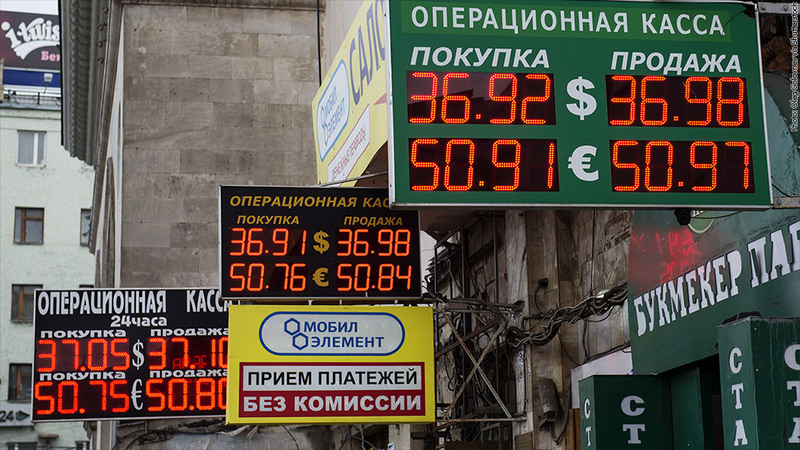 The ruble has fallen 6% against the dollar so far this year, while Moscow's main stock market has dropped 7.6%. Both were under pressure again on Friday. Russia's $2 trillion economy slowed dramatically this year as cash flooded out of the country in response to the threat of tough financial sanctions. The central bank said growth in the second quarter was close to zero. The IMF predicts stagnation this year -- other economists are much more pessimistic. Even before the shooting down of a Malaysian passenger jet over eastern Ukraine last week -- blamed by Western governments on pro-Russian rebels -- the U.S. had cut off access to long-term financing for two Russian banks and two energy companies. Europe has been much more reluctant to adopt tough sanctions, partly due to its heavy dependence on imports of Russian energy. Still, the EU warned Moscow Tuesday that it could prevent Russian banks and businesses from raising finance in Europe if it didn't act fast to ease tension in eastern Ukraine and cooperate with the investigation into the downing of the plane. Diplomats were meeting Friday for a second consecutive day to draft details of new sanctions, but a decision on whether to proceed is unlikely before next week.